This interview has also been shifted to my new blog where you can read the entire piece in one spread. Please visit this link. If you will forgive my black and white comparison, there exists two categories of people - the purists and the pragmatists. Purists go strictly by the book. They are conservative about new methods and much comfortable in being a step back from the rest, never wavering from first principles. Pragmatists do what is necessary to be practical and are ready to push the boundaries into new knowledge. They follow experimental evidence, rather than strictly following someone's theories as to why the world behaves the way it does. I'd like to think a good bit of both is needed when one is an engineer. Not only do you have to be conservative with designs that are stable and cost effective but you must also be results oriented and ready to accept or apply something new if that's what a correct interpretation of data reveals. I must admit it was a bit difficult for me to wonder where I'd place Jobst Brandt, a Stanford alumni and legendary author of The Bicycle Wheel. This work is widely regarded as the bible of wheel building. For starters, Jobst is a resident of Palo Alto in California. While he is a graduate of a reputed institution and an acclaimed author, his experience is also quite rich through an engineering career that spanned from Porche automobiles, Stanford Linear Accelerator Center and Hewlett-Packard to Avocet bicycle products. 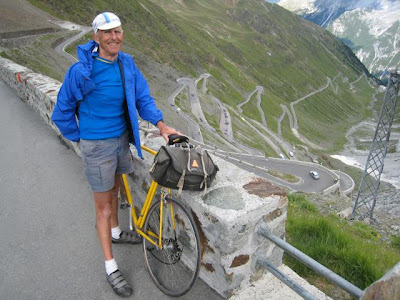 For others, he is a person of many words, opinions and very colorful Apline cycling memories. Perhaps nothing may be more famous about him than his myth busting advices and recommendations on everything cycling. Getting back to my point earlier, reading this book entertained in me the notion of Brandt being the quintessential engineer, you know, the idea I talked about earlier. Guided by both theory and observation of failure rates, Brandt documented in simple English how to build the most durable wheels at one's leisure. A highlight in this work was in how he managed to convince readers that the bicycle wheel is an unusual structure that beat intuition, hence conventional wisdom and folklore would not work in understanding it. It was the precise scientific method with which he approached the subject that was most fascinating to read. But even three editions later, as reviewers say, the book didn't expanded itself to absorb the current advancements in wheel building. The book didn't explore new methods in finite element analysis in novel low spoke count designs, came the complaint. Then there were others who remarked that the book was the work of an opinionated pedant, a cranky Luddite, a hard headed, pompous individual resistant to change. That the book didn't correct erroneous statements, graphs, calculations and so on and so forth. Brandt himself has not shied away from his critics, some of them engineers, and has been fighting back with nothing less than outspoken defense. When asked about this, his understatement would be that he is used to this. Yet, you get a sense that there's frustration somewhere when he admits it is the highlighting story of his engineering career. I suppose it is easy for someone to be enveloped in other people's criticism of Brandt and his ideas. But it was hard for me to read him as I have not known him personally. A few weeks back, it dawned upon me that I must engage in learning where Jobst Brandt and the geography of his ideas and opinions sprout from. I thought that might be a rewarding experience and it was to a degree, as he was very forthcoming in reply to my barrage of questions. The secondary objective of this exercise was to have the enigma of Jobst Brandt as a person stripped away and have this brought to the readers of this blog. This week, I will present to you the conversation I had with the interesting and sophisticated personality that is Jobst Brandt. Topics range from his personal life, his professional career, his cycling achievements and some of his steadfast opinions on engineering and the state of cycling today. Nice work and that's a bold step interviewing Jobst. Can't wait for the rest! Thanks. Will publish Part II soon. Didn't realize the book was so old. I have the 1981 edition, presumably the first since it doesn't say otherwise. What has he changed then? At the time I had read several sources on how to build a wheel and his was the only one that was easy to follow. As an engineer I appreciated the analysis too. Looking forward to the interview. When you say the first edition of book is old, I may recognize that better, as it was published even before I was born! What engineer were/are you? Jobst has been the staple of bicycle tech on nntp forever. Might be over technical at times. "He managed to convince readers that the bicycle wheel is an unusual structure that beat intuition.."
about it unclearly is, I think, more a reflection of how we try to force reality to conform to our preconceived notions. End quibble, I look forward to reading more. the bicycle riding is always the best option in the world and its shows that we love our nature and earth. Great and thanks for all your efforts in raising the bar. In the famous admonition of Ecclesiastes, "Now let us praise famous men"! Excellent idea, Ron. would have left such a mark, be such a distinguished engineer, even be worth listening to. Jobst does a good line in self-pity about the less well-accomplished not appreciating him, something you've picked up on, but the kibitzing of ankle-nippers is a necessary precondition to being Jobst. Is it just me or does the chain on his bike seem to sag a lot? Good observation. Perhaps his chain slipped off the front chainring? When I was in high school (I'd guess '87), I used his book to build up a set of wheels. It was so easy to follow his directions. I don't know if I got the tension right but that wheel set lasted longer than pretty much any set I've had. Ron, I really enjoyed this interview. Bravo for chasing-down JB and conducting such a thorough, interesting exchange.